Scooby Doo has always been a greatly popular cartoon and is still shown today on Cartoon Network. The show has been on air in some way or another since 1969 and is still being produced today. There are four main characters, along with Scooby himself of course. 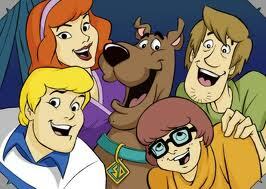 The four teenagers include Shaggy, Fred, Daphne, and Velma and together they solve many mysteries that come their way. The gang spend their days getting into all sorts of trouble and solving many mysteries that involve the teenagers facing ghosts, ghouls, monsters, and criminals. The episodes are full of fun, action, and adventure and it’s no wonder why they have always been so popular. Shaggy and Scooby are usually together. Shaggy is Scooby’s owner and is a little bit of a coward himself who is usually more interested in food that what is going on! Scooby is a Great Dane who can speak English a little bit and tends to put an ‘r’ before the words that he says. Shaggy is always being chased by ghosts and is a bit scared to say the least! Scooby is the star of the show and a very loveable character who is scared of his own shadow! His mistakes often lead to the group solving a mystery. Daphne is known to be a little clumsy. She has been kidnapped a few times and left imprisoned until the other teenagers finding her. It’s usually Shaggy and Scooby who end up finding her, but it does tend to vary. She has a big crush on Fred too. Daphne adds a bit of glamor to the show with some handy everyday things in her purse that often prove to be useful. Fred is the leader of the gang and tends to try to take charge. He and Daphne are often wondering off alone whilst the rest of the team heads off in another direction. She is calm and collected most of the time and very focused on the task in hand. Velma is the clever one and is very intelligent at that. She is a key to solving a lot of the mysteries and loves to read mystery books as well. She has a habit of losing her glasses at times and finds them often falling off her head! Velma is great at finding the vital clues that the gang need to solve the mystery! If you are a Scooby Doo fan, then you can watch episodes on Cartoon Network and see if you can help solve the mysteries. Every episode has a new plot and a new mystery to solve. The gang gathers clues to reveal who has committed the crime! Not only can you watch the episodes, but you can also play the games. Cartoon Network has loads of great games to play online so you can help the gang solve mysteries and plot your way out of a haunted house. You can keep yourself entertained with games online until the next episode is on! Scooby will no doubt be around for many more years to come. Olivia is a freelance writer based in North Wales. She is a great fan of Cartoon Network and Scooby Doo. When not watching the shows; you’ll usually find her swimming or reading a good book.